The Indo Pak war broke out in December 1971. It was another day when young Arun who was commanding a tank, received orders to assist at Shakargarh and he mobilized his team and they neared the Basantar river. As they approached the mine laden battle field, they came under heavy attack from the howitzers and a large posse of tanks. Though outnumbered, Arun in his tank called Famagusta maintained his position and continued to face the onslaught. It was the proverbial, ‘cannons to the left of him, cannons to the right of him and cannons in front of him, which volleyed and thundered’! It was the ‘Charge of the Light Brigade’ in real. He tore through the battle lines and single handed destroyed four tanks before being hit. He was asked to retreat as his tank was on fire! Unconcerned, of personal safety he fought till he was fatally hit by enemy fire! They had held the ground and the enemy forces were forced to retreat! Arun Khetrapal was born on 24 Oct 1950. His father was serving in the Indian Army and the family had a long tradition of producing soldiers! He too was fired with zeal to join the Army and after completing his schooling at Lawrence School at Sanawar joined the prestigious National Defense Academy at Pune in 1967. On completion of his basic training, he went to the Indian Military Academy and passed out in June 1971 and was commissioned into the 17 Poona Horse regiment. Barely six months later, the increasing hostilities between the two nations escalated into a full blown war. Arun bid farewell to his mother who told him to fight like a lion and not return like a coward. At a young age of 21 years the valiant soldier had shown the world ‘The Power of One’! 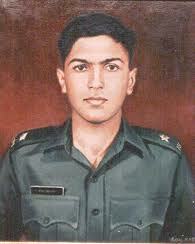 He was awarded the highest honor the Param Vir Chakra for the exceptional courage! Mrs Indira Gandhi told his mother ‘Aap Dhaniya Hai’ ( You are truly blessed) with moist eyes! The two premier institutes, The National Defense Academy and Indian Military Academy have named the parade ground, auditorium and main gate after the hero. PS- Image Kind courtesy Google. This story is dedicated to a war hero on the Republic Day! What a GREAT story and post to share with us on your Republic Day! Penned wonderfully! The painted picture of 2nd Lt. Arun Khetrapal is a great addition :-) I *love* the "Chetwode Motto"! Princesa Fiona, I am very happy that you liked this true life story of greatest sacrifice! P.S. ~ Very apt title! आपका सडसठ वाँ फालोअर बनते हुए मुझे खुसी हो रही है. What a great post for today! A Big Salute to bravehearts like Arun that we sleep in peace each day. Hats off.. And many thanks for this warm tribute, we really need to remember our heros for all their courageous works. Thanks Arti, that you liked this one!Surely, as a nation we must take pride in the sacrifice of such legendary heroes! The post brought tears to my eyes. How the politicians of today have spoilt our country for petty gains. What an amazing post!!! Indeed a man who had a brave heart. A very wonderful tribute!! Thank you Anjuli! I admire such people to no end! A wonderful tribute to a brave heart on a special day! Yes Shilpa, A brave soul he was! This format is surely convenient! Thanks to you and Sujatha for making me wiser! Kalai, that was indeed a very kind gesture from you!My regards to your father, a solider, whom I always hold in highest esteem! He was the real hero indeed. May his soul rest in peace. So kind of you, Agnes for this remark! He was a true hero indeed! Thanks a lot for sharing it with us. Thanks Ria! He was a true hero indeed! he was a true hero. I have written something upon this. I request you to read my next post sir. Thanks Adi! I read your poetry which was nice! Its a great fact to know about 2nd Lt Arun Khetrapal. Thanks a lot for sharing on this Republic day ji. I feel truly proud to see people who had sacrificed the life for the country. Nothing in this world can match them! Hats off to the mother who agreed to send the son for serving the country! She is a God to me!! Thanks Anand! Such people can never be forgotten! Wow, what heroic tale. Its so heartwarming what Indira Gandhi said to his mum. And his mum was so brave for letting her son leave to go fight at war. Such an apt story for your celebrations. Wishing you well on this Republic Day! War heroes in any part of the world deserve the utmost respect!Thank you Sam! Oh that's why the name Khetrapal in Doon Academy and in Pune. True Hero and the nation Salutes him and his family. Saru, it made me very happy that now at least some people know what Khetrapal means! Believe me I had goosebumps when I visited these academies and saw them first time!Thank you! Thanks and my greetings to you also! I am very happy you liked this real life story! Hey I've read about him. Hats off to such bravery. It was electrifying to read about him.. what a soul truly.. So true! The bravery was unique.. 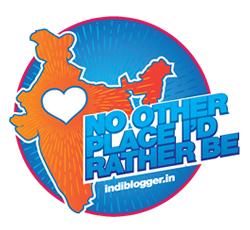 Thanks a lot Padmaja ,for following my blog.. Such bravery! And such a shame that war takes the lives of too many. War is the worst thing to happen! Great post for Republic day! The destruction war causes.. It's so sad.. Thanks Juhi! Totally agree that war is something which should never happen as it causes so much death and destruction! I feel ashamed for crying/sulking on little failures in life when I read about Army men who fought for the nation. Thank you Rahul ji. HE WAS INDEED A HERO. Wel it is my pleasure to follow . But you know in 71 we lost one part of Pakistan which is now Bangladesh . I don't wanna go in detail but India supported that war .He was indeed your hero. Don't take me wrong .I am saying what is in my heart . Arun Khetrapal was a true hero. Love the title Braveheart, it captures the qualities of the soldier perfectly. Great story to be shared on our Republic Day.. We youngsters need more of such real life stories. Jai Hind!! such bravehearts r the real heroes... fantastic read. Thanks Jyoti! Nice to see you back! :)Always ,appreciate your comments! Brave story indeed Rahul Sir. I wish I'd have read it on Republic Day too. But nevertheless, real-life heroes always succeed in making me ponder over their courage. You took time off to read even now is a big compliment:)Thanks for that lovely comment! i salute the brave souls. their sacrifices gifted us INDEPENDENCE. Thanks for visiting my blog and liking this real life story!Indeed a lot of sacrifices have made us a proud nation today! Sujatha, am grateful to you for those kind words! I salute his him and his mother too, for telling him to come back as a winner and not a loser. It takes a lot of courage to say such a thing for a mother. Really a very inspiring real life story, I feel blessed to be born in this country. Well, it is due to thousands of brave hearts like him that civilians like me are living without fear... I salute them! And special thanks to you for sharing this with us. Wow , what a hero. and I salut the mother too who had the courage to say this to her son. Thank you for putting this post I really love reading of such heroes who are someone to talk about ..
Bikram, I am happy that you liked this post, as despite so much sacrifice by ordinary people today's political class still believes in divide and rule, rather than building a strong nation! politics and politcians both need to be SHOT DEAD.. in my eyes .. they wear white to hide the blackness in them ..
our nation will only do good once these lot are thrown out of the country exactly like we did with the british .. So true Bikram! Hope one day in not to distant future we will have something to really feel proud about .. Thanks for this post Rahulji. I have heard my dad and grandparents tell us stories of war heroes and there is something that always gives me goosebumps.